I see food. My mind goes: “Mhmmmmm….Foooood”. My taste buds chime in “Mhhmm….salty, spicy, minty goodness yumyumyum”. 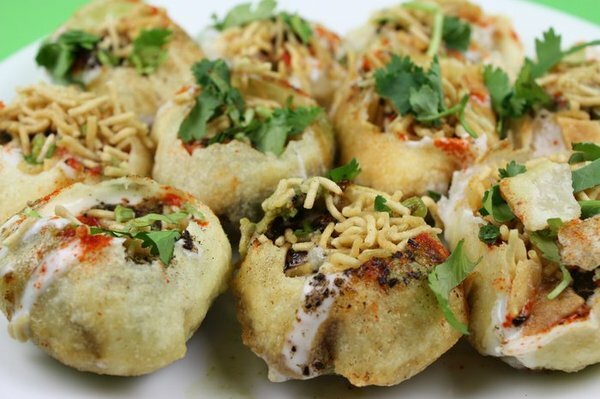 Dahi Puri is my absolute downfall in the way of Indian Street Food. I can’t begin to start describing it without salivating and even thinking about it means I will probably bare the 50% chance at getting some mild form of food poisoning to go get some on my lunch break. But here goes. Dahi Puri is a famous Mumbai Street fare.Mumbai street fare is known for its chaat which are different versions of filled puri. Puri is fried wheat based thin bread that are crisp but somehow also chewy and absolutely delicious as is. For the chaat they make them into these small puffed round balls. They give you 6 of these balls,cut off the top and fill them about a third full with this spicy potatoey mixture. On top of this they put finely chopped tomato, cucumber and coriander and then drown the balls in Dahi, which is essentially like yoghurt and a thicker, sweeter version of curd. Then they put this sweet tamarind-date chutney and mint chutney on top and sprinkle it with sev-this spicy, crunchy snack mix thing. It is quite impossible to describe HOW amazingly delicious this is. Far from being just another Indian street food it is quite possible THE best Street Food. In the world. Ever. I have never eaten dahi puri but reading this makes me want to go on a search for dahi puri right now!